Songs of Eretz Poetry Review is pleased to present “Bluefish” by John C. Mannone, Poet of the Week. One of Mr. Mannone’s poems will be featured every weekday during the week of January 18, 2015. Mr. Mannone’s biography may be found here: http://eretzsongs.blogspot.com/2015/01/poet-of-week-john-c-mannone.html. 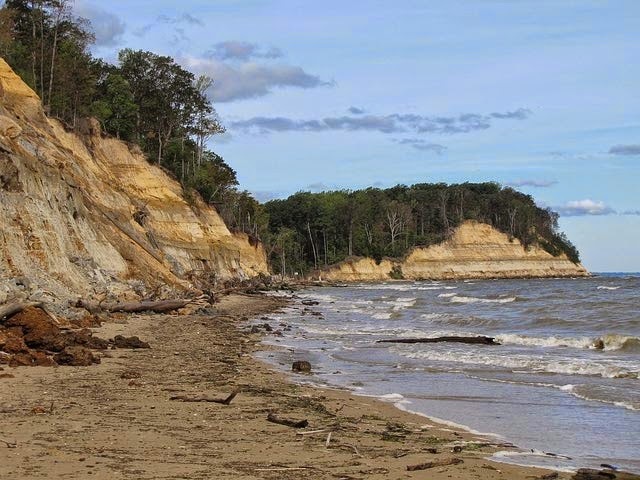 the Miocene cliffs in Southern Maryland. of bone in sand and clay and in the water’s ebb. the only thing precious from that. in a cliff top cottage with a screened-in porch. out of its groove as if a switchblade. The bluish green under the fin, fading. its belly. Carefully wrapped it in newspaper. even the fish you have to kill to eat. on the cutting board, knife in my hand. And the stainless steel sink prepared as an altar. while I quickly severed the head of that bluefish. My youngest asked me if it went to heaven. I said I didn’t know, that it wasn’t a pet. Its eyes stared back: wet, black, glassy. and down the sink drain. Their bites sharp as razors. greedy, too, especially when frenzied. they shimmered under kitchen light. and a can of Italian plum tomatoes. I ladled the broth mixture over rice, and the fish. All its blue gone, changed to soft gray. Poet’s Notes: As I mention in a recent spotlight for this poem at Split Rick Review http://www.splitrockreview.org/news/2015/1/4/contributor-spotlight-john-c-mannone, “Bluefish” emerged from several influences. I talk about some of them there (the abiding image Cathy Smith Bowers talks about, Ellen Bass’ poem “What Did I Love” about killing chickens, and my recollections of bluefish). So I’ll briefly mention one other here: family and food poetry. Bluefish is a remarkable species and delectable as far as I’m concerned. I created the original recipe with mackerel caught off the Florida Keys when I was first learning to scuba dive in the early 70s. The fishermen on the dock were kind enough to give me several mackerel for me and my family and friends joining me on a December vacation (but I had to clean them). I’ve since then used salmon and rockfish (ubiquitous in MD where I grew up). So, I can attest to the recipe suggested in the poem. But of course, the poem is much more about relationships than about food. Food does bring families together and can often provide a metaphor for that. Most of the things mentioned in “Bluefish” are true, but may have been collaged from several trips. Interestingly enough, I invented what my youngest son had asked (if the fish had gone to heaven). I had been working on a collection of poems in which food has a prominent presence, but it’s not a bunch of recipes in verse. I think I will pepper the poetry collection with anecdotes about the food, and of course, about my family, too. “Bluefish” will be numbered among them. Editor’s Note: I like the mood that the poet creates here, the gentle narrative style, and the preserved magic of that special day. 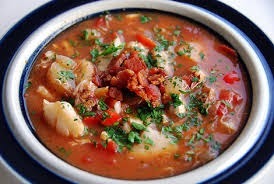 There is also something to be said for the fish stew recipe! “Bluefish” was previously published in Split Rock Review, summer 2014.